I purchased this piece from the Salvation Army a few days ago to be placed either in my craft room or in my basement. When loading it into my vehicle I noticed the mark on the bottom. I tried their website and they no longer identify older pieces of their furniture. When trying to search images on google I couldn't find anything like it. I love this chair and I can't believe how great its condition is. If anyone has any answers I would greatly appreciate any knowledge you can provide to me. It's worth in the $100 range. How do you know? 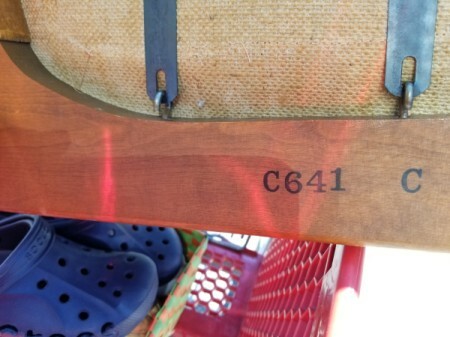 I'm trying to find out info about the chair itself year made that kind of thing. The value is alright o know but they year and other info related to the item is what I'm truly seeking. Thank you! 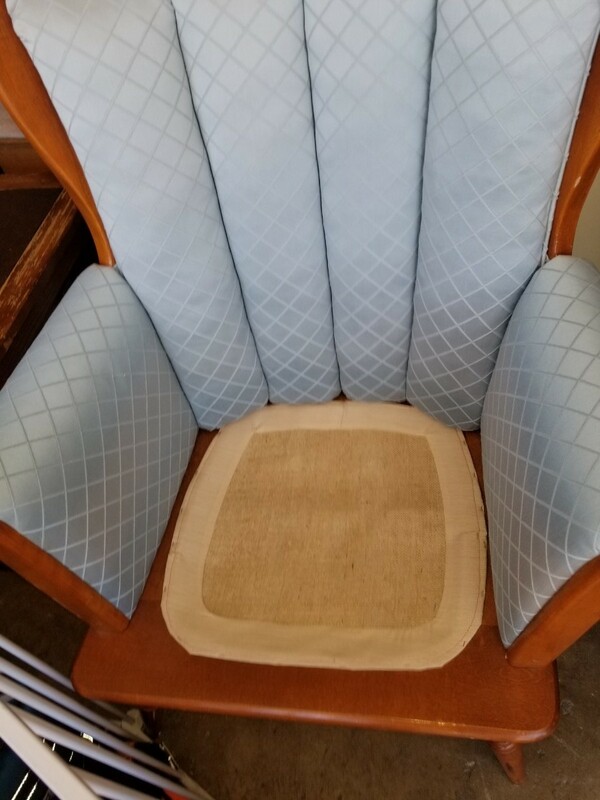 It clearly has the Mid Century Modern lines in the wood...but the fabric and upholstering does not seem like it goes with the piece.....but that is just my eye...usually the MCM pieces are all about clean lines, very little pouf or frill. The other thing that is puzzling is the wood seat part...I am thinking someone may have modified a dining chair to make it better suit their tastes...the only reason I am suggesting that is two fold....1. I have never seen one exactly like this and 2. Usually upholstered pieces have a frame or slats or wire then wood...this looks like a solid wood base at least from what I can see. It is disappointing that the company won't help ID the piece...but I guess there are so many that they could be doing that full time. The blog is by Leonard Riforgiato, I don't know him, but maybe you could find him on Facebook or LinkedIn or some other social media site and see if he would answer a private message. Just a thought...I have been known to do things like that and 9 out of 10 times people are flattered and help. Every now and then, I get no response or a nasty gram back. Good luck in your search!! Hope this gives you a new direction to try! There is a very large amount of information about the company available on the Internet but it is still difficult to pinpoint actual dates an individual piece of furniture was made. The reason the company web site states they can no longer answer questions about vintage/antique pieces is because this is not the original company and they do not have access to all of the records of the original company. The original company went bankrupt in 1994 and the name rights and designs were purchased by the South Beach Furniture Company located in Florida. So - if you hear or read of the modern Heywood-Wakefield company it will be referring to this company and not the original company. The new company makes reproductions of the original styles and uses the same type of wood (birch) and very similar stain finishes. This company has 2 manufacturing plants and several "store room companies" that are located in different parts of the US. "New Heywood-Wakefield, like old Heywood-Wakefield, is made from solid Northern Yellow Birch. 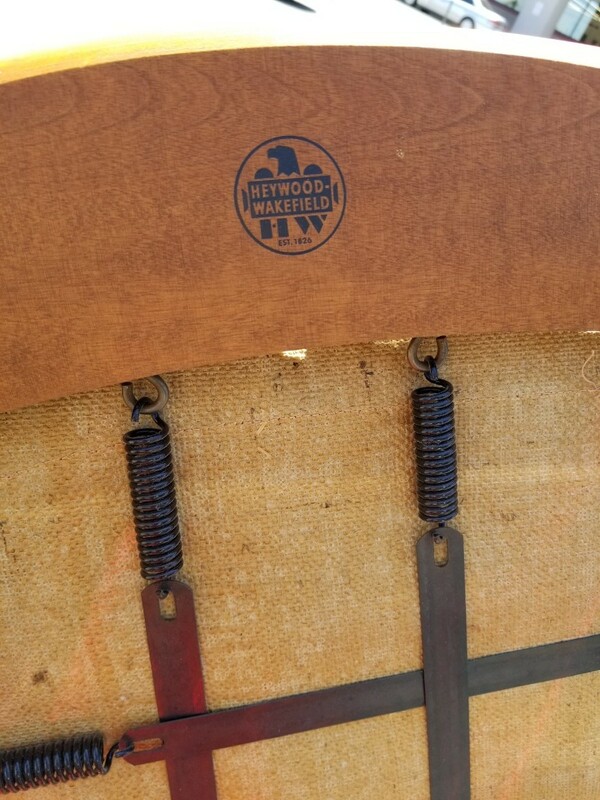 There is a misconception among some people that Heywood-Wakefield furniture was made from maple, but except for some early 1930s styles, this is not the case." "While its wooden furniture plant in Gardner, Massachusetts closed in 1979, a branch in Menominee, Michigan continued to manufacture metal outdoor seats, auditorium seats, and school furniture. The Heywood-Wakefield Company Complex in Gardner was added to the National Historic Register in 1983. The South Beach Furniture Company acquired the rights to the name in 1994 and reproduces its wooden furniture." Your chair frame is original and the seat is very original and is a feature of the original company. History of this company states the Eagle stamp was used after 1949 but in other places the date is unclear. 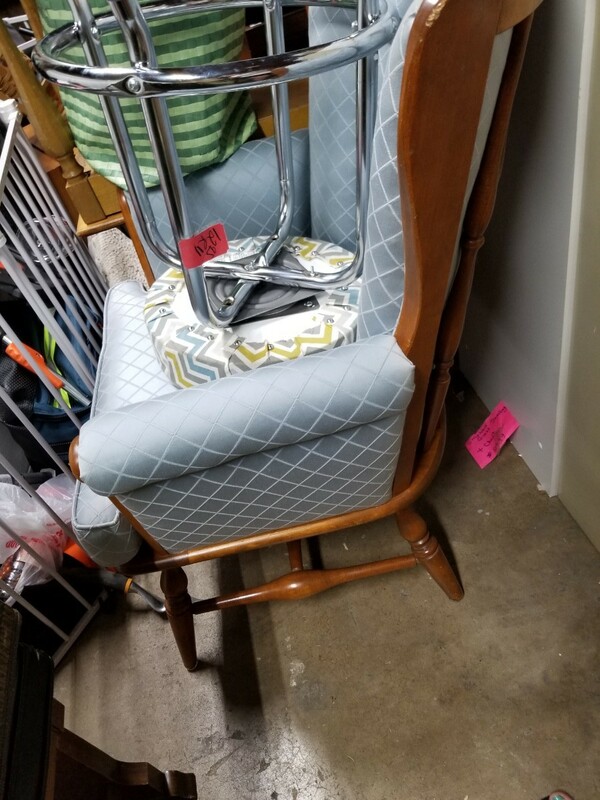 here is a chair listing on eBay that shows the same type of seat bottom. 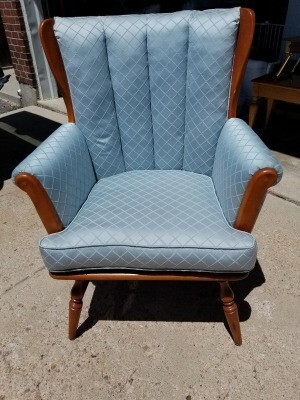 This type chair is called by different names but usually it is called a "Captain's chair or bedroom chair or lounge/accent chair". It looks like your chair sits lower than a dining room chair(?). I cannot find any evidence that Heywood-Wakefield made any "channel back" chairs and they apparently did not make very many upholstered chairs which leads me to believe that your chair has been reupholstered or is a chair from the "new" company. - (Just my thoughts). 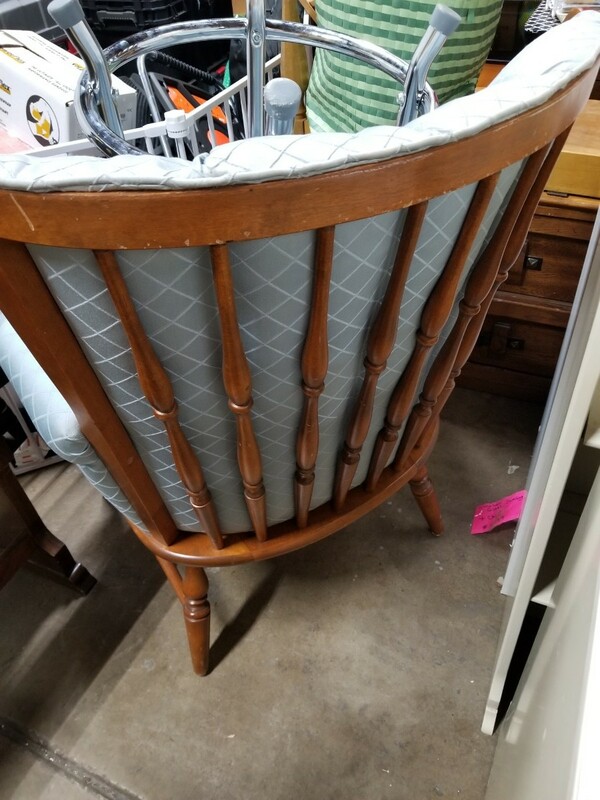 I do not think it is a dining room chair as their chairs seem to be in 2 styles - one has an extended back with and without arms (for support and style?) and the other is a very plain chair. here is one style of dining room chair. You can check out some different styles of chairs currently listed on eBay but remember, most of these sellers may know very little about the chairs or the company so many will have errors as to dates, type of wood, etc. and asking prices are mostly what would be considered "fantasy" as in what they want for their chair or what they believe it is worth. Only a small percentage will sell for these asking prices but this is popular furniture so many will sell for good prices. Here is a link that has excellent information and you may be able to ask questions and submit photos to the blog forum. Try to read several spots as each one has different info. If you are interested in finding out more from people in the know, then you could seek a free appraisal or pay $17 to Barnaby's for a more comprehensive report. I noticed rust on the pieces that hold the bottom together so maybe you should think about trying to get that stopped before it goes any further.